NEALE Whitaker has been feeling blue lately, but the Vogue Living editor-in-chief couldn’t be happier about it. The Block judge, Sunday Times HOME Magazine columnist and stalwart in the interior design industry has become renowned for his enduring romance with the moody tone. “Blue isn’t the new black, it’s the new white,” he said. Venturing from his room at Como The Treasury (which he dubbed “the best hotel in Australia”) Whitaker spoke to Perth interior designers and bloggers at King Living in Nedlands. 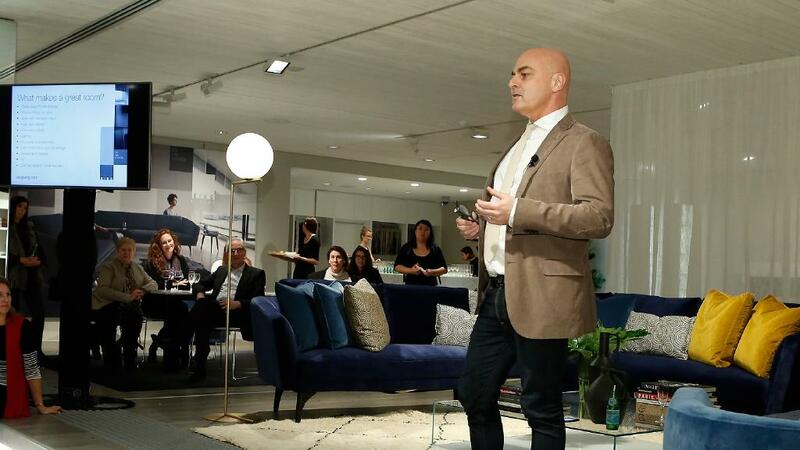 He led the creative crowd through his top design tips at the luxe furniture destination and shared his recent journey through global style mecca Milan. It may sound like an odd remark coming from a magazine editor, but Whitaker said ultimately the home should be a reflection of your personality. “I kind of live my life by that line because I do believe that when it comes to the home it’s always good to know what the trends are and why they are, but I do believe your home is all about you,” he said. According to Whitaker the scale, shape and colour of a rug is vital to making a good first impression. He said if anyone was on the market for a new rug, you can’t go past a Moroccan Berber style addition. Your home should reflect your personality and style, so don’t be afraid to merge different interior styles or periods in your space. “My favourite interiors are always the ones that blend different styles, different tones, different periods, different colours,” Whitaker said.